I sent out loads of last minute Warmshowers/Couchsurfing requests in the towns I’d be passing just before I left as I wanted to avoid camping as much as possible in this weather. I thought I’d be camping the first night somewhere just past Kirikkale, but someone put me in touch with someone’s friend and I got a text just as I was passing through saying that I could stay with them. This is the beauty of having a Turkish sim card, my first local sim of the trip. They’ve just changed the rules in Turkey, meaning you can use a local sim in a foreign phone without registration for a two month grace period before it gets cancelled. Before your phone would be cut off after a few days and you had to pay a large fee to authorise it. Buying the sim wasn’t an easy process – every shop seemed to want a different price (despite the fact they were all selling the same product) which really frustrated me. In the end I got a card for £10, with 250 minutes, 250 texts and 250mb data. It makes it far cheaper for me to contact locals, and more importantly they don’t have to spend a fortune either to ask me where I am. Having internet is the biggest curveball though – suddenly I can get online whenever and wherever, just as I do in England. In some aspects it’s invaluable – I can check the hospitality websites while I’m camping and I can look up addresses when I’m lost. On the other hand, it means I’m just as reachable as I was in the UK. I found myself one night replying to messages on Facebook in my tent in the middle of nowhere and found the experience too strange. Luckily the data isn’t enough to use excessively so it stays turned off unless I really really need it. 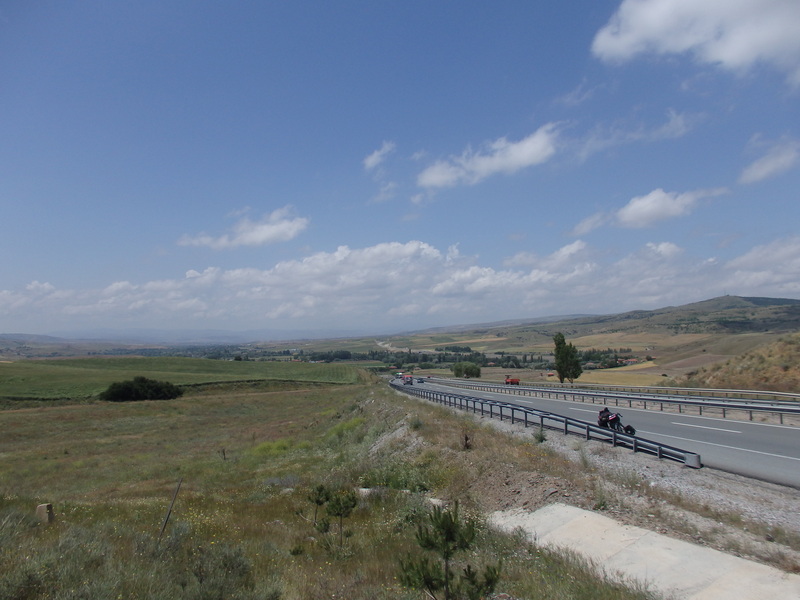 The main road was less busy than the section into Ankara, and I was grateful for both that and the lack of rain. But there was plenty of my least favourite sight – mammal roadkill. Excuse the grim photo, but I thought I’d take one shot to show what I pass everywhere. 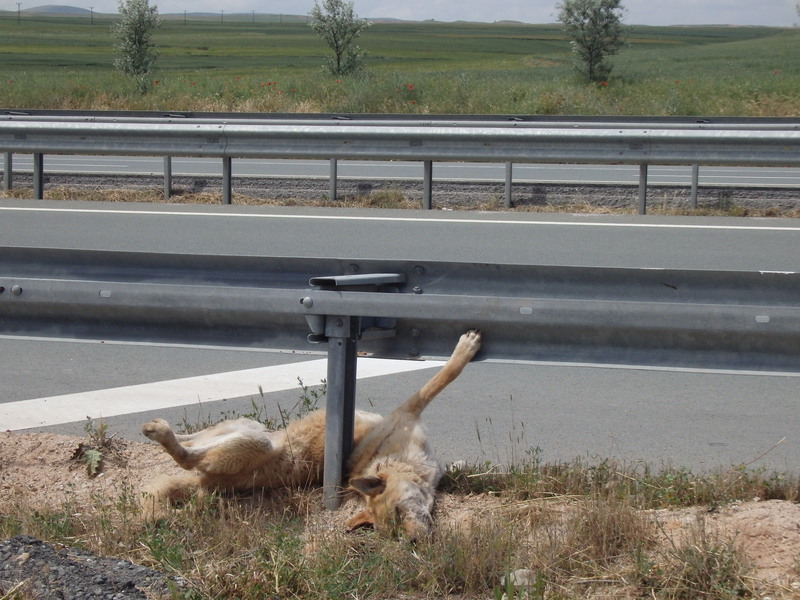 On this day I saw three dead dogs on the side (or middle) of the road. When I spot a dead animal I put my t-shirt over my face – the smell of a decaying animal is nauseating. And if I don’t see them I often still smell them – the stench catches you and lingers at the back of your throat. I’m an expert on the stages of decay in animals now, from fresh kill (like this photo) to nothing but bones and flattened fur. The road slowly changed, becoming far more ‘wild west’ with red soil and sharp rocks that grow suddenly out of the ground. The head wind was making up for the rain’s absence and by 6pm I was exhausted and struggling to get quicker that 10km/h. 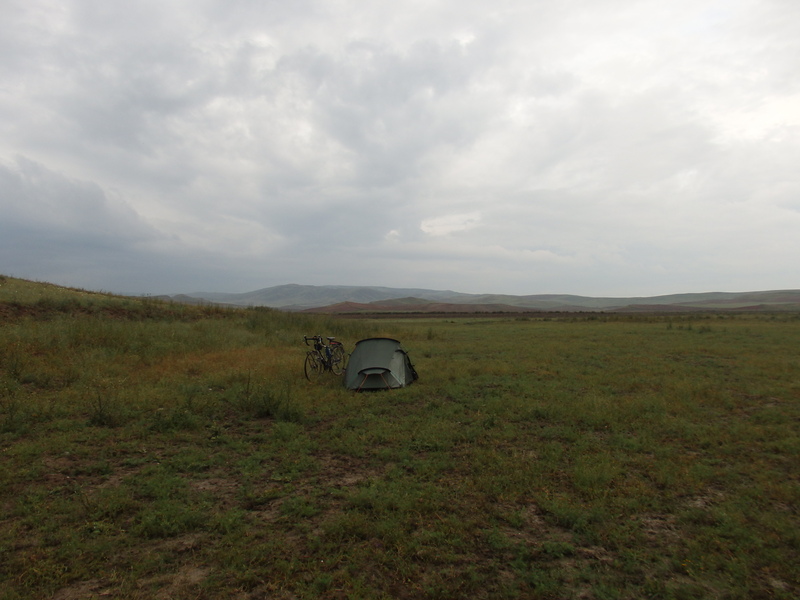 I’d wanted to reach town and try and find a hotel to stay in, out of the rain, but it was still dry and I’d had enough so I stopped and found a campsite. 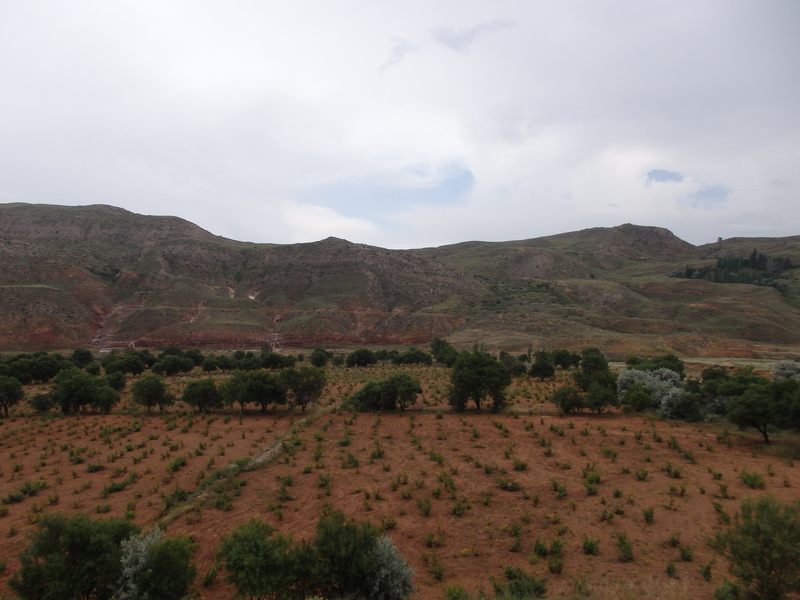 A small valley with un-farmed land looked perfect. The grown was dried mud so I could easily push my loaded bike a few hundred metres away from the main road. You’re never really alone in this part of the world though, and before dark two herds of cows were marched across the other side of the valley within eyesight of me. I didn’t care though, and figured that if they were still out so close to dark they were unlikely to be up and about at dawn. During the night I was kept awake by violent thunderstorms. It’s hard to sleep when rain is crashing into your tent roof and the lightning bolts lit up my portable home when they struck. I didn’t like that my tent was the highest thing around when the thunder came close to the light. At 6am I woke up suddenly to the sound of my tent being rustled by something/someone. I lay totally still, until I heard it again – the unmistakable sound of my tent being poked. I gave a loud and confident ‘gunaydin!’ (good morning in Turkish), and poked my head out. I was greeted by a bemused looking shephard and his herd of 50 cows around my tent. No doubt he’d just come over this way to be nosy, and I tried my best to smile and pretend not to be pissed of at being woken with such a shock so early in the morning. I started packing up as he left, at which point another shepherd had reached me to say hello with his herd. I was in a better good mood to meet him and we chatted a short while. Then it start to rain, hard. The field around me had turned into a bog during the night’s down-pouring and I regretted coming so far from the main road. I had to take my bags off and then carry my bike step by step all the way back. 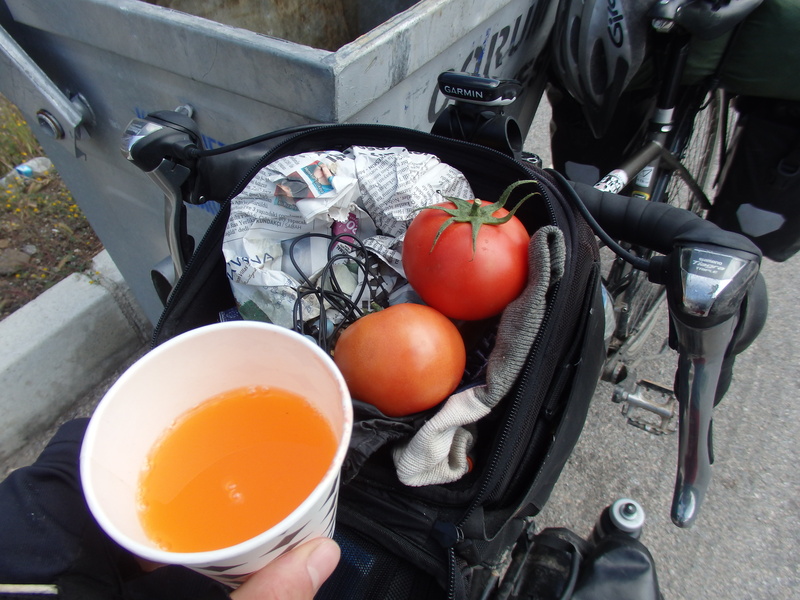 Luckily the shepherd helped me carry my panniers as far as he dared leave his herd, for which I was extremely grateful. 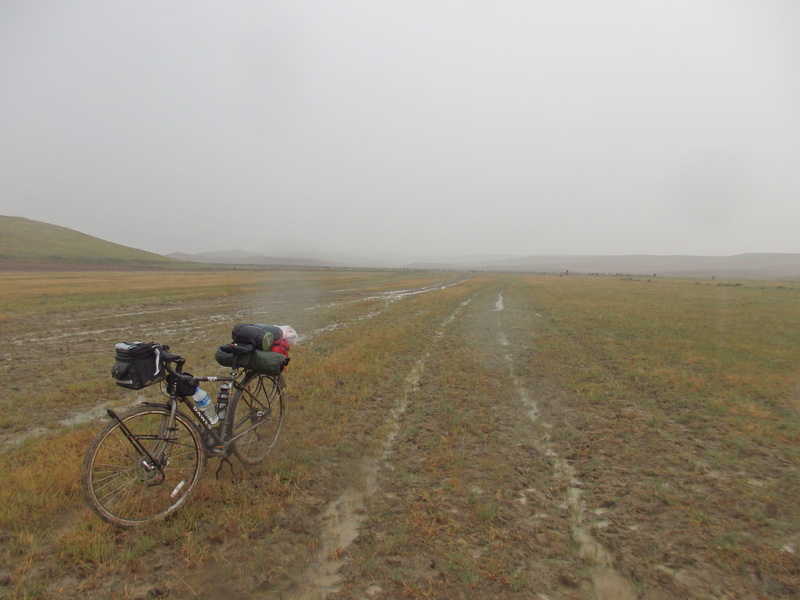 But by the time I got back to the road the damage was done – I was soaked through and covered in mud, head to toe. I spent a couple of hours cycling in the pouring rain. I was already soaked so saw no point in stopping. One more storm fucked me in the afternoon too, but I found a petrol station to hide in and once again was drowned in both attention and cay. 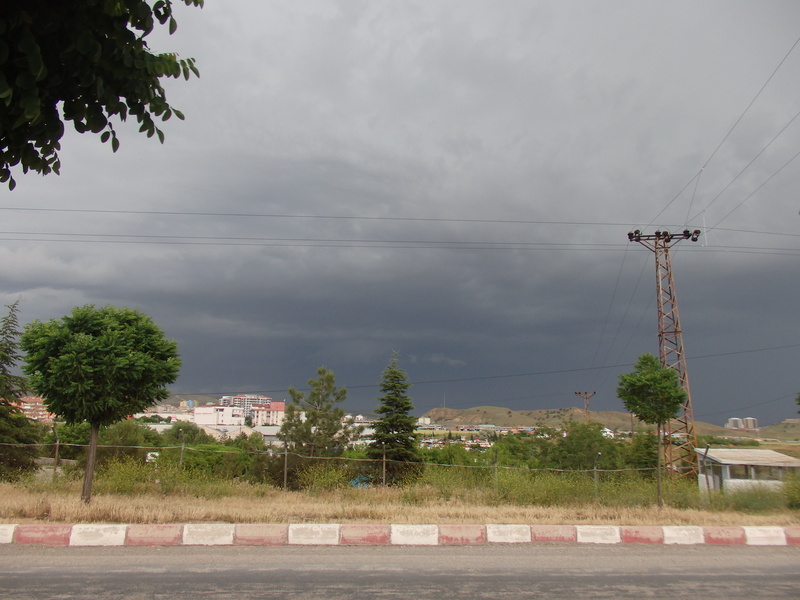 I was happy not to be camping in Corum. My host took me into town and showed me the castle and a narrow cobbled road which is ‘apparently’ the worlds smallest street. 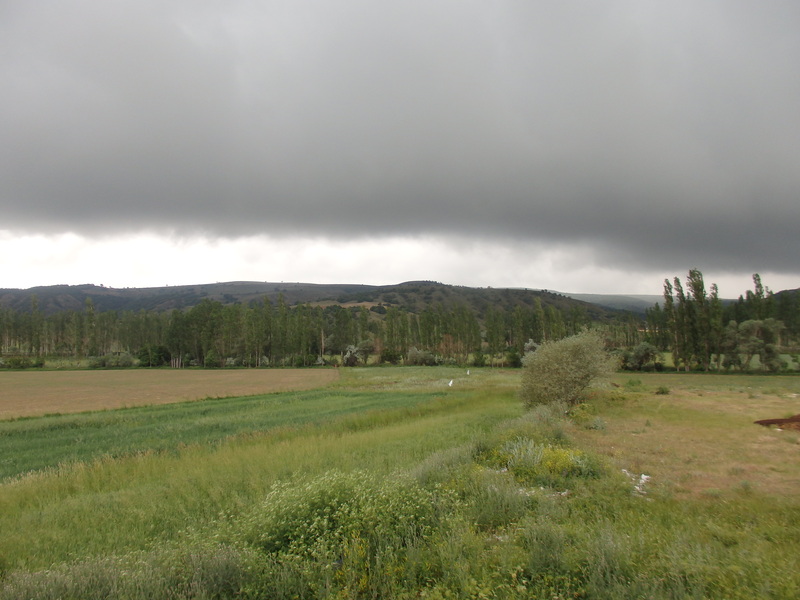 The following morning I set off for Merzifon. The sun was out to celebrate my 100th day of cycling and it was boiling. Halfway up one of the larger hills a truck driver called me over and offered me a soda. 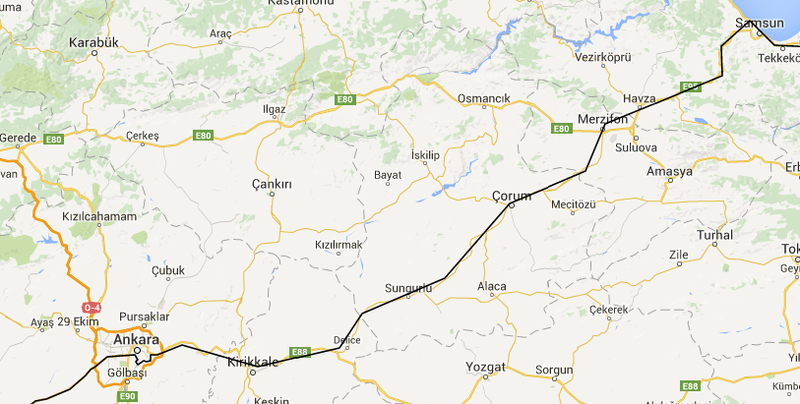 He was driving with a load of tomatoes from Antalya to Samsun so that they could be taken by boat to Russia. Naturally, I was given enough tomatoes to last me the day. The experience was a little embarrassing though – he’d managed to break the glass on the bottle top and I stupidly put my lips to it to drink from, cutting my lip open. I tried to hid the cut, but within seconds blood was dripping all into my drink and down my chin – charming. He handed me some tissues and said goodbye, clearly thinking what an idiot I was! 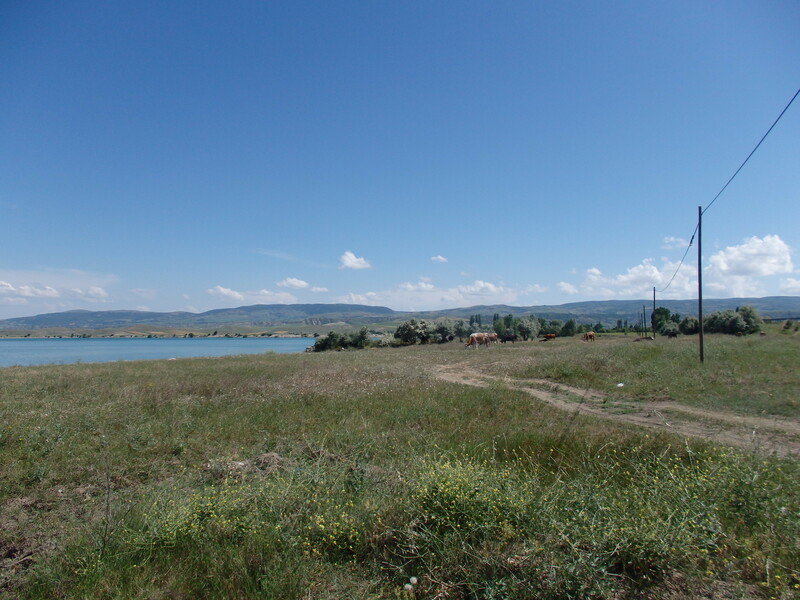 Just before I arrived in Merzifon I passed a gorgeous lake and so I stopped to a photo. There were a couple of shepherds I hadn’t noticed sitting in the shade watching their cows and, of course, I was invited over to sit with them. 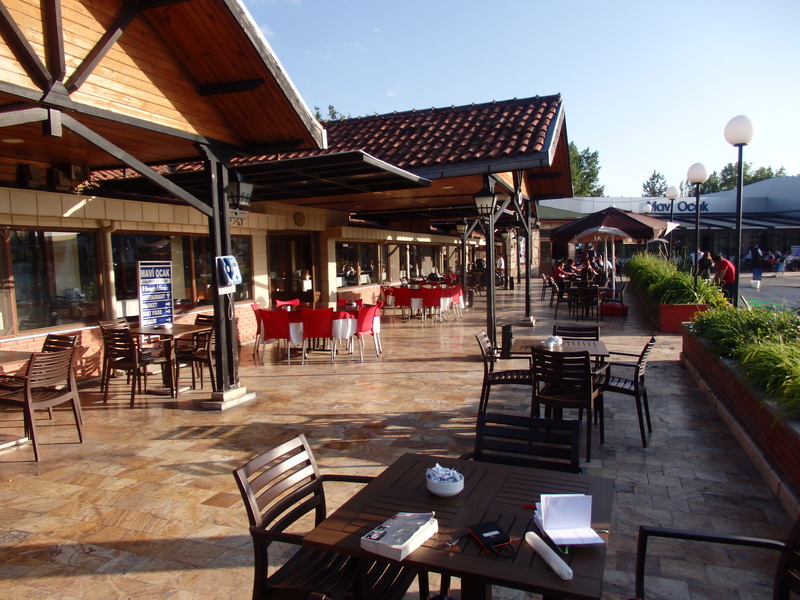 I eventually reached Merzifon and stayed with a really fun group of guys around my age. They all worked in the local airport. We went out for dinner, coffee and then ordered a load of takeaway booze. The shops aren’t allowed to sell alcohol after 10pm but it seems a covert phone call does the job. It felt like we were calling up the local drug dealer at a strange hour of the morning – but we just wanted some beers after 10pm. 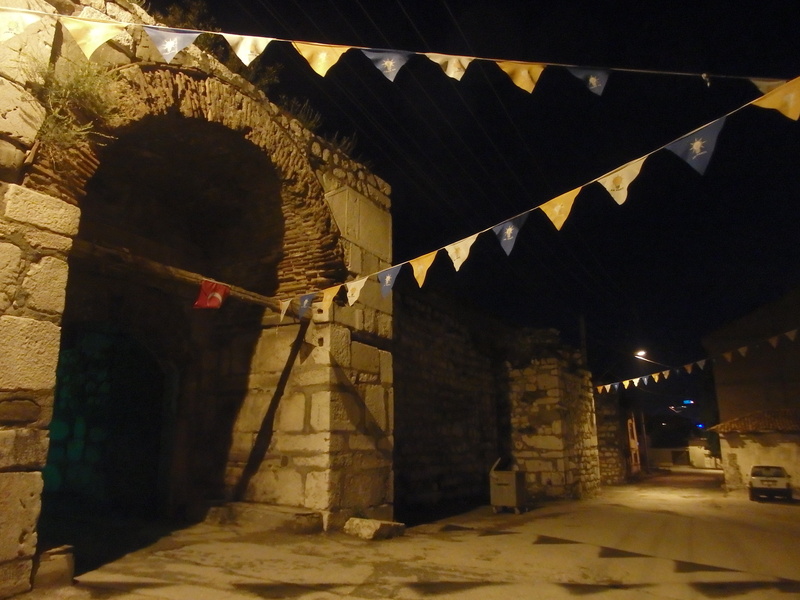 Drinking culture is strange in Turkey, it clearly exists, but operates behind closed doors outside of the big cities. The government’s super sin tax (of about 50%) puts most people off. When I used to work in a bar I used to complain about the cost of a pint even when it was less than half my hourly wage. The price of a beer in a bar in Turkey isn’t much less than England, but it’s probably the same as what you earn in an hour working in one…. crazy. Once again, my wallet wasn’t allowed out my pocket for the evening of indulgence. These bloody Turks! After a delicious breakfast I left far too late, for my planned day of over 100km (and >1000m climbing) to the coast. I made two friends during the day – the first was a stray puppy that found me when I was having my lunch break in an overgrown bus stop. 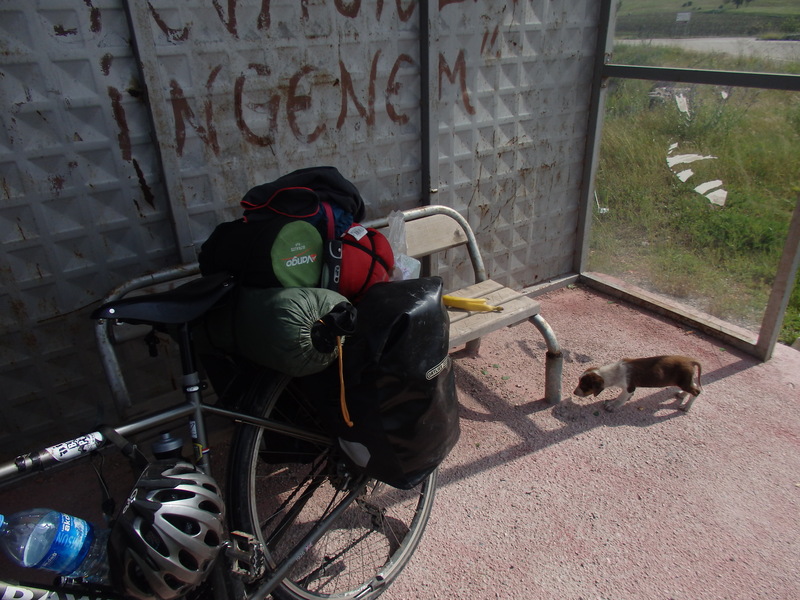 The second was another cycling tourist – the first I’ve come across since Bulgaria. His name was James, a fellow Londoner and was on his way home after spending the last year cycling around the world, raising awareness for the Teenage Cancer Trust. It occurred to me that he was also the first Brit I’ve come across in quite a while, and it was weirdly reassuring to talk to someone with a similar accent to my own. He had only 6 weeks to get back to the UK, so he wouldn’t be enjoying the last stretch too much. More imminently, I also had another 60km to make before dark, so said bye and pushed on. 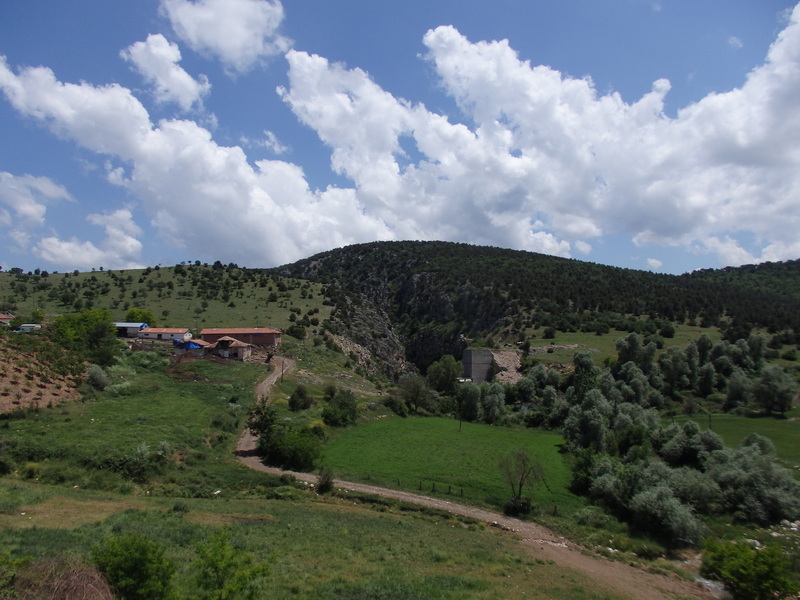 I made a short detour from the motorway into Samsun to take scenic route into town, but found myself climbing some crazy steep village roads to get over the hill into town. I was exhausted from the last few days cycling, but thrilled to be back by the sea – where I wanted to be. The following morning I bought some new headphones for the bus ride and bought my ticket back to Ankara. The buses aren’t cheap here – each way cost me a painful £11. But the buses are amazing. Spacious seats, screens on the back of the seats with movies, games and TV available, free tea & coffee, snacks and ice cream and charging sockets. The days of my life I spent while studying in Leeds taking the Megabus to and from London seemed third world in comparison! It was bizarre to be covering 5 days of cycling in just 6 hours of driving. The experience was strange – I relieved and reflected upon the last week’s sights and experiences in just a few hours. I hate to admit it, but the bus ride was really enjoyable. 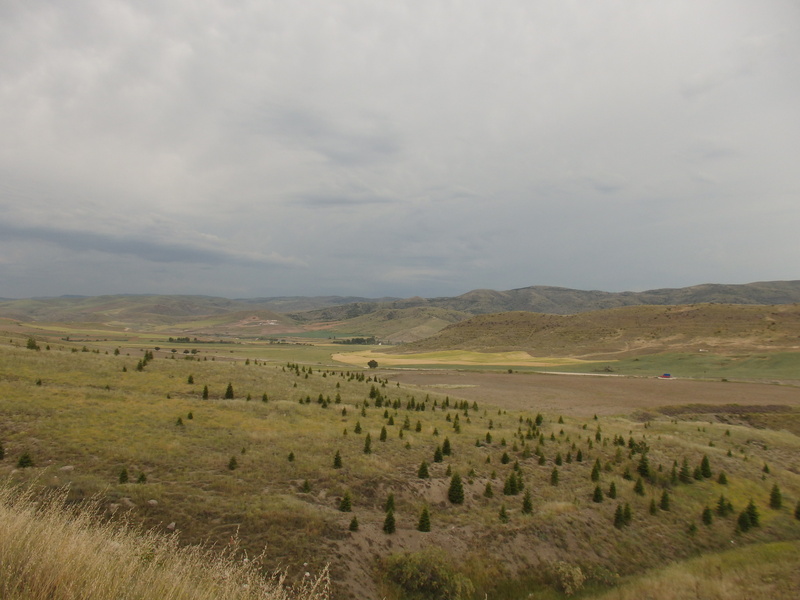 With a couple of meters higher off the ground you see the landscape with much greater perspective. The road was gorgeous, I’d been taking it for granted on my bicycle, but it was really breathtaking. 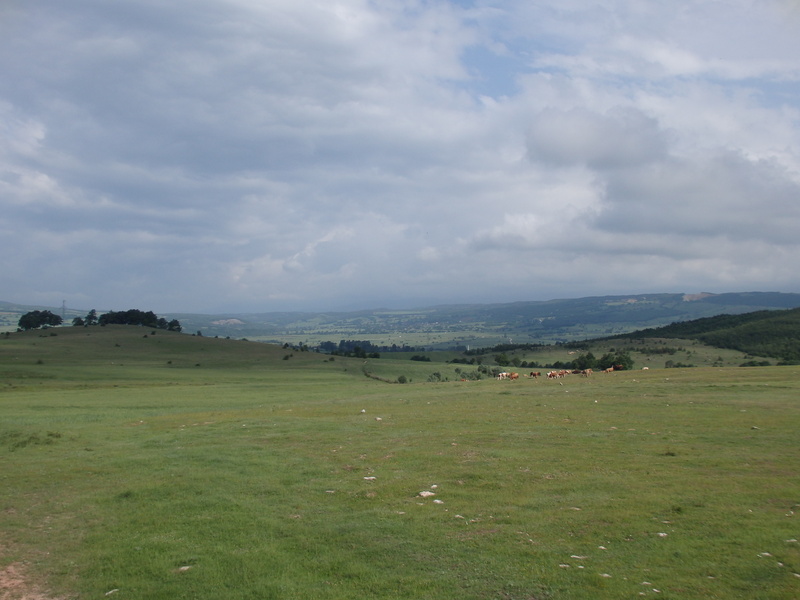 Huge mountains and vast plains that rolled through valleys. We made a short break at one of the service stations that I’d made shelter in after cycling in the storm after my early morning shepherd wake up. It was so strange to be back under such different circumstances. The sun was out, and I bought an ice cream to relish the contrast. 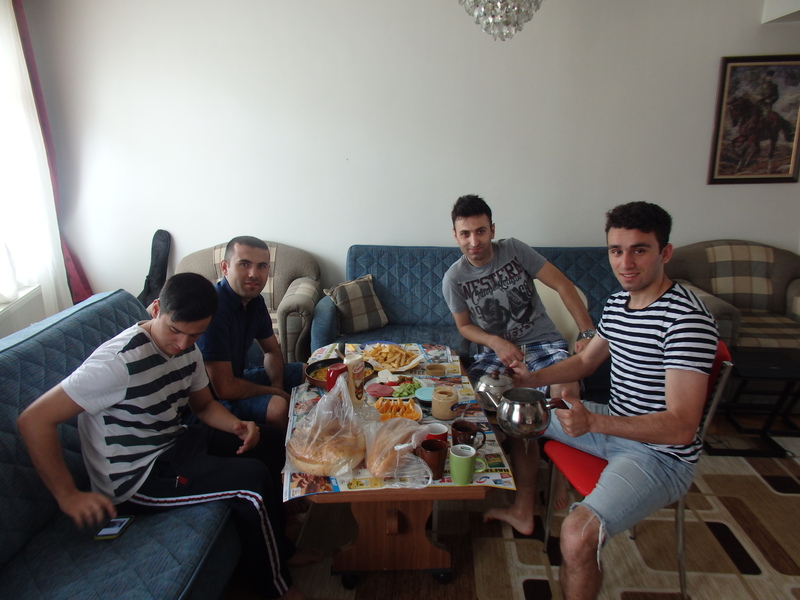 Finally we reached Ankara, and I returned to my host who lived so close to the embassy. Again, it was strange to be sleeping in a familiar place – it’s the first time I’ve done so in over 4 months (excluding my stay with family in Denmark). In the morning I went back to the embassy. My stomach was tingling with nerves, but luckily this time everything went to plan. My visa was ready and I was instructed to head to the local bank and transfer $80 to them. That was easier said than done – I needed to find a Turk who would sign my papers with their ID number (otherwise I couldn’t make a transfer) and when I realised I needed to do the same to change money I had to head somewhere else to change my lira to dollars. After a couple of hours faffing I walked out of the embassy with a shiny new visa in hand – happy days! 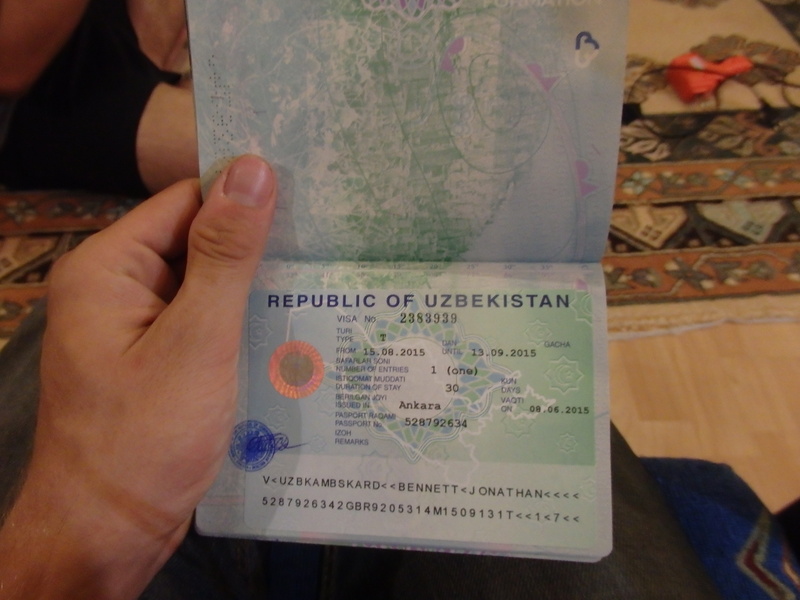 Never before have I invested so much time, effort, stress and money in a visa. I splashed £22 on the bus, but I saved $70 on the Letter of Invitation, so I felt I was quids in. 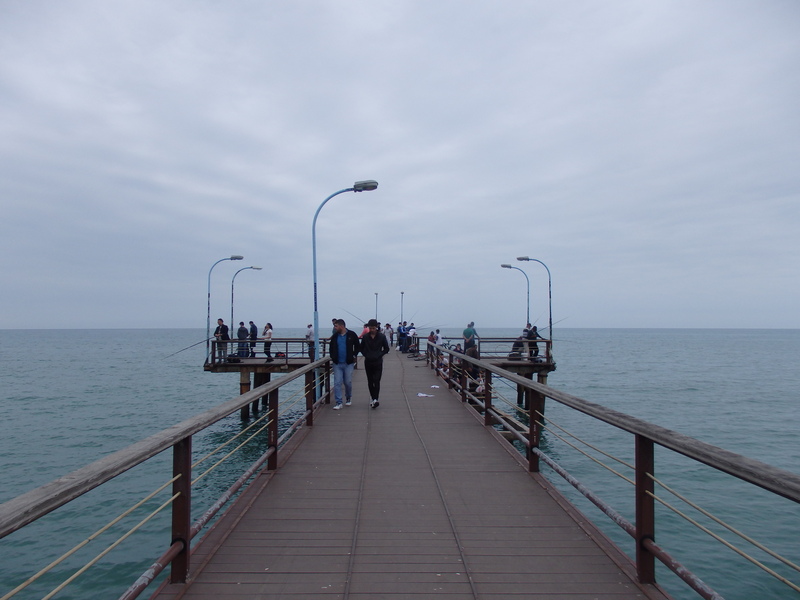 The next day I explored Samsun, although there wasn’t very much to explore. 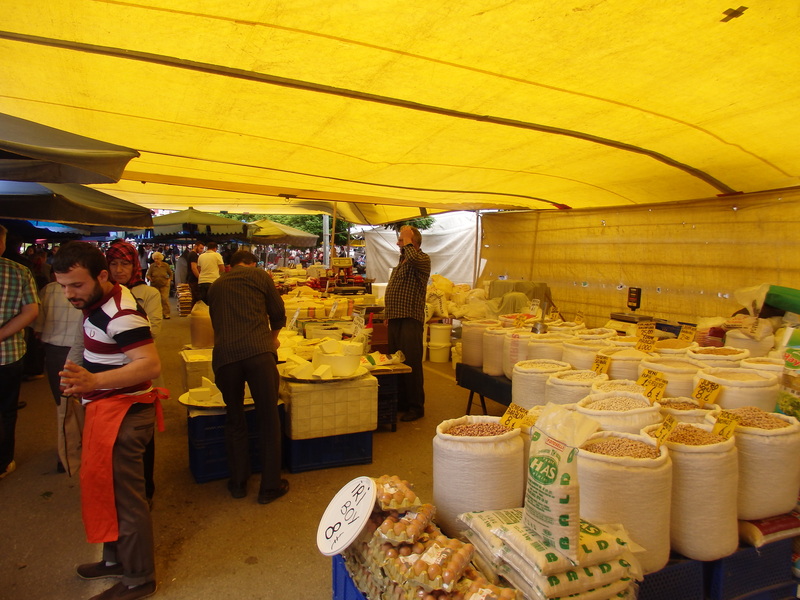 I bought some fruit at the local market and strolled along the seaside promenade where old men sat chewing sunflower seeds and young lovebirds sat among the left over shells. 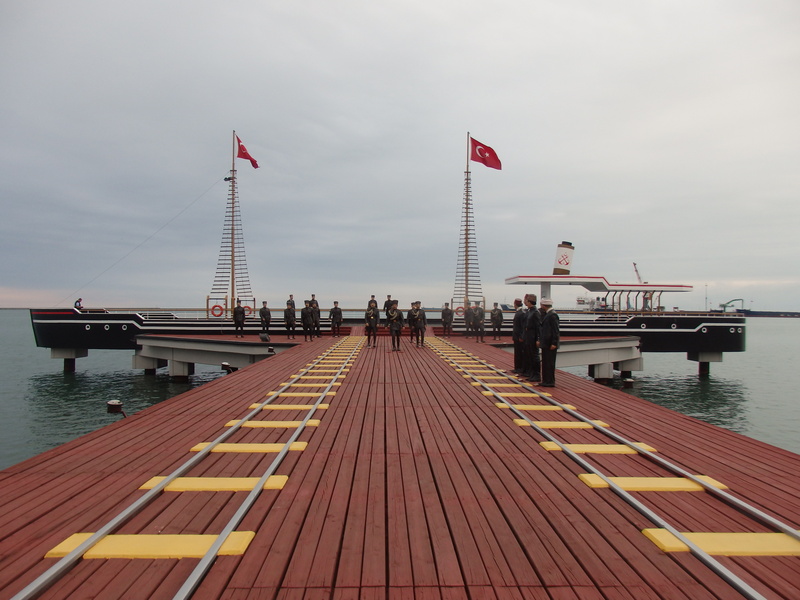 I took the tram into town and visited the SS Bandirma replica ship – a very strange replica of the boat that took Ataturk from Istanbul to Samsun nearly a hundred years ago at the start of the Turkish national movement. 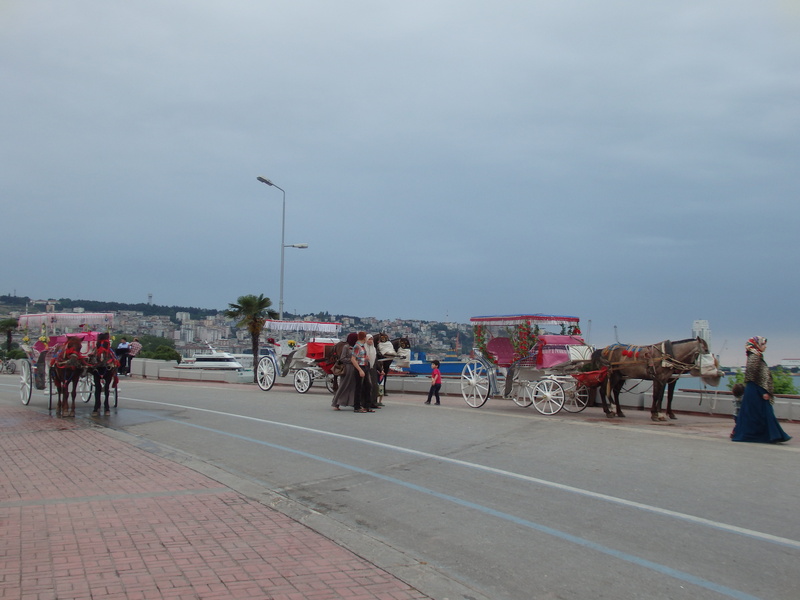 Along the coast there were lots of funny looking horse-drawn carts to take the Turkish holidaymakers along the seaside road with pop music blaring out the speakers – another strange sight. 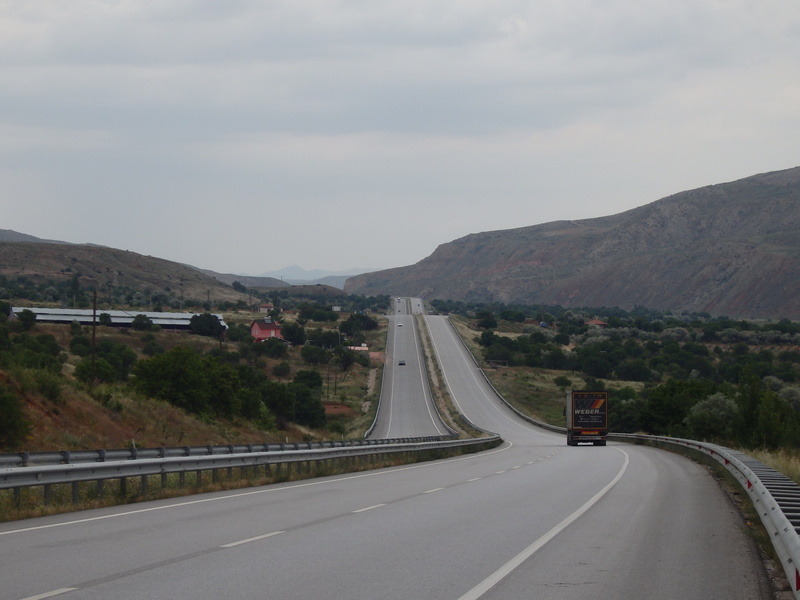 And that was pretty much all to do in Samsun, so the following morning I was off again – one straight road to follow all the way to Georgia.